Question: I’m wondering statistically what the best months are to advertise a property for rental. On my own I can figure out it’s probably not the dead of winter, but was wondering the answer from a professionals data driven point of view. Answer: The best way to measure this is to look at how long a home is on the market and how close the final rent price is to the asking price. Since 2010, the data shows that the best time to list your home for rent in Arlington is from March – June, with June listings moving the fastest and May listings commanding rents closest to the ask price. 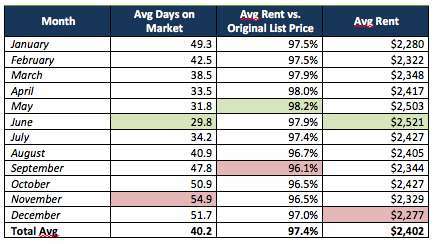 Homes listed for rent in November spend the most days on the market, taking an average of 25 more days to rent than homes listed in June. Somewhat surprisingly, landlords who list in September cut rents more than any other month, compared to the asking price. My guess is that it’s due to owners offering a higher original price because it’s still summer, but missing out on the spring/early summer rental demand. The data was pretty consistent across different housing types (detached/single family, townhome, and apartment) and by zip code. Check out each table below for some specifics on your home type and zip. The data below represents all 12,256 rental transactions recorded in MRIS (Realtor database of record) in Arlington since Jan 1, 2010. 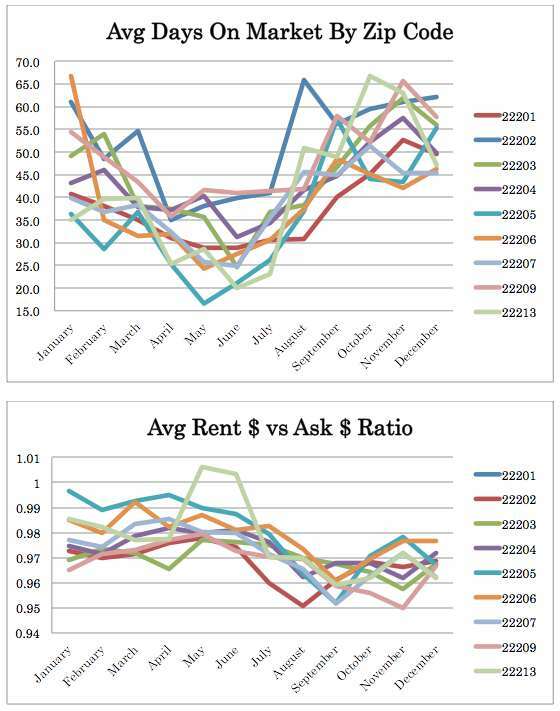 The data is organized by the month they were listed for rent. There are three data sets presented. 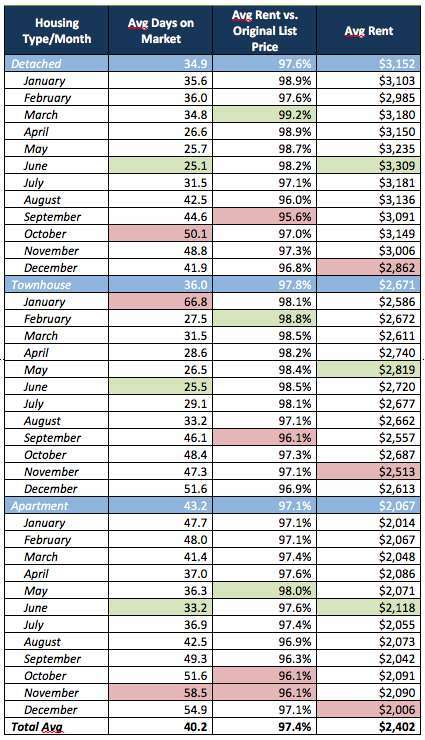 The first is all rentals by month, the second is by housing type (detached/single family, townhome, apartment) and month, and the third is by zip code and month, presented in two separate graphs because the table was too long (email me if you’d like to see the data table).